Investing in clean, renewable energy in the water sector will benefit utilities, their customers, and California's efforts to reduce global warming emissions. It takes more than snow and rainfall to keep California’s taps flowing; it demands energy and lots of it, particularly during a record-setting drought. The state’s water and wastewater utilities consume large amounts of electricity to pump, treat, transport, and deliver water–and their energy requirements are expected to keep growing as California responds to increasingly severe drought. By investing in clean, renewable energy sources, water utilities can better adapt to changing conditions while creating new revenue streams, protecting their customers from electricity price volatility, and enhancing the state's efforts to reduce global warming pollution. Nearly 20 percent of California’s electricity is used by the state’s water sector. Water and wastewater utilities–there are more than 7,000 in California—account for roughly half of that electricity use. Utilities’ electricity consumption is likely to significantly increase in the years ahead because of expected increases in groundwater pumping, water treatment, and water recycling due to increasingly severe and prolonged droughts. 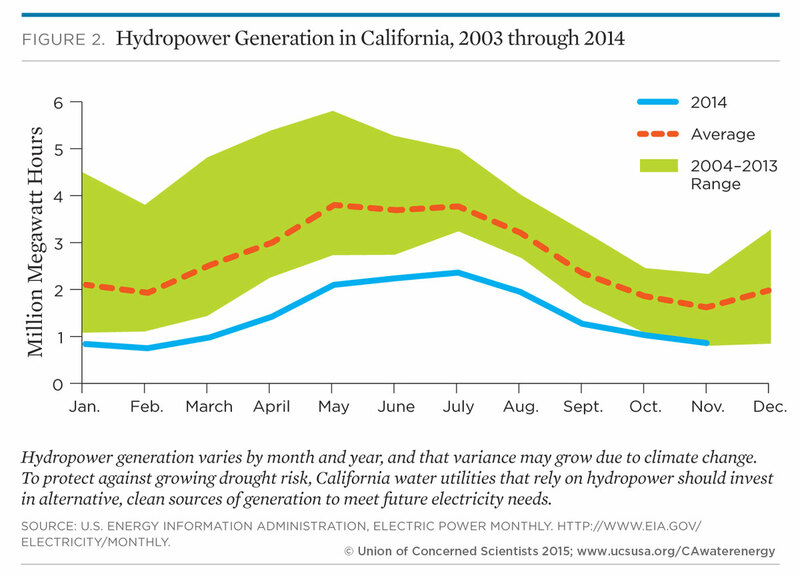 What's more, large parts of California’s water sector are reliant on hydropower. This leaves them vulnerable in times of severe drought, when less water is available to generate electricity. Turning instead to dirtier energy sources both causes increased carbon emissions and exposes customers to price volatility. Investing in clean energy would help utilities achieve greater control over their electricity supplies. Renewable energy resources are now more competitive than ever on price; they also help protect against fossil fuel price volatility and the accompanying price risks to the consumer. Given their size and number, water utilities can also exert a significant amount of electricity purchasing power. Plus, many own assets and infrastructure that could host renewable generation facilities. These include reservoirs that can host solar panels, canals and pipelines that can provide hydropower, facilities that generate biogas, and land that can be used for wind, solar, biomass, and geothermal energy generation. Utilities also stand to benefit financially—new revenue sources are available to utilities that transition to cleaner sources of energy. They include selling excess renewable electricity, cap-and-trade proceeds, and fees for accepting organic wastes for renewable energy generation. California water and wastewater utilities are also in a unique position to help California adapt to drier conditions, reduce global warming emissions, and achieve its climate goals. There is a significant lack of publicly available information about how much electricity and what types of generation sources are used by water and wastewater utilities. Many utilities are not asked to provide data about how much and what types of electricity they use to extract, treat, and transport water. This lack of information hampers the state’s ability to understand how the water sector can optimize low-carbon energy. What's more, there is no agency responsible for determining the most cost-effective and beneficial ways that water utilities can reduce global warming emissions and rely on cleaner sources of electricity. Collect better information about the water sector. Most water and wastewater utilities are not currently required to report publicly the sources and amounts of electricity use in a standardized form. California should ensure that state dollars lower overall emissions. Any water or wastewater utility that receives funding from the 2014 water bond, Department of Water Resources grants, or cap-and-trade revenues should be required to prove that its overall utility-wide emissions have decreased. Reduce hurdles to clean energy investment. A number of laws and regulations hinder the ability of water utilities to make clean energy investments. For example, the process leading to connecting generation to the grid is cumbersome and should be streamlined.